Instead of forcing our customers into a single axle option for their Jeep JK Wrangler, Wrangler Unlimited, Rubicon, TJ, YJ and XJ Cherokee, Dynatrac offers many different levels of complete bolt-in off-road axle assemblies to meet a broad variety of ways that people use their vehicles. From the Mopar JK Rubicon Dana 44 to the ProRock 80,™ we can meet just about every need, can help you choose the option that best fits your needs, including your budget. For the ultimate in Next Generation Dana 44 axle strength and capability, Dynatrac designed and built the ProRock 44. The high-clearance heavy duty ProRock 44 is available in front axle applications for Jeep JK, TJ, and YJ models. It features massive axletubes up to 3-inches in diameter with a 0.500 wall thickness. Each housing comes with heavy duty Dynatrac end forgings, suspension brackets that are 50 percent thicker than stock, and a nodular iron differential cover. The ProRock 44 can be ordered as a bare JK housing to accept your Rubicon locker, internals, knuckles, steering, and brakes or as a complete assembly with any locker in any lug pattern to match your application. You can have a ProRock 44 with your choice of 4.10, 4.88, 5.13, or 5.38 gears. The Dynatrac ProRock 44/60 Hybrid offers all of the strength, weight, and high-clearance advantages of the ProRock 44 differential, with the bomb-proof steering and axleshaft components of the Dynatrac ProRock 60. The Dynatrac ProRock 44/60 Hybrid axle is available in bolt-in or custom applications. It features 35-spline 1½-inch-diameter axleshafts, huge 1480 steering joints, “1-ton” locking hubs, and Dynatrac Pro Series 60 heavy-duty knuckles, spindles, and wheel hubs. Several optional brake packages are available to meet your needs. Dynatrac ProRock 44/60 Hybrid JK axles include exclusively designed ABS and stability control sensor mounts to maintain all factory function of these systems. The Dynatrac ProRock 60 was the first of its kind when it was unveiled in 2002. 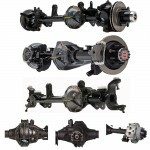 Today, it’s an off-road strength and performance standard to which all other supposed Dana 60 based axles are compared. The ProRock 60 is available in bolt-in and custom applications with 35- and optional 40-spline shafts. The nodular-iron ProRock 60 housing combined with the 9¾-inch high-pinion gearset supplies “1-ton” strength and durability, improved driveshaft angles, and more ground clearance than a much weaker traditional Dana 44 axle. Dynatrac ProRock 60 front axles include massive 1480 steering joints, heavy-duty end forgings, and precision machined wheel ends. Rear axles are available in both semi-float and full-floating configurations. Dynatrac ProRock 60 JK axles include exclusively designed ABS and stability control sensor mounts to maintain all factory function of these systems. No other axle in existence handles this much torque, has this much ground clearance, and is this lightweight. The ProRock 80 is engineered to handle the most abusive environments imaginable, no matter if you need unmatched axle strength for your 1,000hp rock bouncer or 8,000-pound fullsize truck. Do your worst, the massive 11¼-inch ring gear, giant 2-inch diameter pinion, and 40-spline 4340 axle shafts give the ProRock 80 the ability to handle huge tires, a massive rig, and a heavy right foot. The Dynatrac ProRock 80 JK axles are designed to handle the largest tires with the hottest motor off-road, while the exclusive Dynatrac-designed ABS and stability control sensor mounts allow your Jeep to maintain all factory function of these systems for safe street use. The ProRock 80 is the pinnacle of aftermarket axle performance. Dynatrac offers the factory Mopar JK Rubicon New Generation front and rear Dana 44 axles. These axles are available with a 4.10:1 gear ratio. Other aftermarket ratios are available. Each axle features a Tru-Lok electric locking differential. The front axle assemblies have 1.31-inch-diameter 30-spline axleshafts with 1350 U-joints, the rear assemblies come with 1.41-inch-diameter 32-spline axleshafts. Front axle assemblies are available with and without the 12-inch JK brakes. All rear axles include the factory Wrangler disc brakes, complete with parking brake. The J8 Military front axle is similar to the JK Rubicon front axle, but it’s a little more heavy duty. It features an open differential and 4.10 axle gears. Aftermarket gear ratios for the J8 housing include 4.88, 5.13, and 5.38. Unlike the Rubicon 44 axle, the J8 axlehousing allows the use of an ARB Air Locker or Detroit Locker. Also, the axletubes in the J8 axle are slightly thicker than what is found in the Rubicon 44. The J8 has 0.310-wall 2.5-inch-diameter tubing versus the Rubicon 0.250-wall 2.5-inch-diameter tubes. This military-spec front axle also has larger 13-inch disc brakes compared to the JK Rubicon 12-inch rotors. The lug pattern of the J8 axle is 5-on-5.5, compared to the Rubicon 5-on-5. Dynatrac offers the Mopar replacement Dana 60 axles as a bolt-in upgrade for the front and rear of the Jeep Wrangler JK. These Dana axles feature high-clearance housings, 35-spline chromoly axleshafts, Spicer ring and pinion gears, and selectable electric lockers. The front axles include “1-ton” unit bearings, SPL 70 steering U-joints, 35-spline Warn locking hubs, and 3.5-inch diameter axle tubes with a 0.370-inch wall thickness. Rear axles feature a full-float design and 3.5-inch diameter axle tubes with a 0.390-inch wall thickness. The Mopar Dana 60 axles have an 8 x 6.5-inch wheel bolt pattern, heavy-duty brakes with plug-and-play ABS, and are available in 4.88:1 or 5.38:1 gear ratios. Price and instalation on front and rear pro rock 44 full package. We're very happy to provide quotes, but we need to do it by email and/or phone because of the many variations and additional questions that we will need to ask. Please call us at 714-421-4314 or send an email to sales@dynatrac.com. Also, we do not do installations. We have many dealers who sell and install our products, and we can help you find one in your area. You have a few options, depending on how you want to use your YJ. We’re very happy to provide quotes, but we need to do it by email and/or phone because of the many variations and additional questions that we will need to ask. Please call us at 714-421-4314 or send an email to sales@dynatrac.com. Had a bearing fail and broke a chromoly shaft in my d44 at 50mph - I need help figuring out if I should upgrade or stay at a d44. John -- Whether you should upgrade or not depends a lot on which vehicle you have, how you have built it so far, what else you plan in the future, how you use it and the type of four-wheeling you like to do. We'd love to talk to you more and give you a recommendation -- give us a call Monday-Friday at 714-421-4314 or email us at sales@dynatrac.com. Thanks! Looking for a Dana 44 with 5.38 gears front and rear. Could u send me some info on these axles. The axles will be going under a 1993 jeep Cherokee xj. Thank u.
Chris -- we offer a ProRock 44 for the front, but we don't recommend it for the rear of most vehicles unless it is an ultra-light vehicle without big tires and with not a lot of engine power. The besting thing for you to do is fill in this form, http://www.dynatrac.com/axle-quote-form, and we'll give you our recommendations and estimates. Or you can contact us Monday-Friday at 714-421-4314 or sales@dynatrac.com. Thanks! Awesome website! How do you guys compare the Mopar JK 60's vs. a prorock 60 combo? The mopar 60's are obviously cheaper in cost...just wondering what the biggest differences are. How does the elocker in the mopar 60 compare in strength and reliability to the tried and proven ARB?